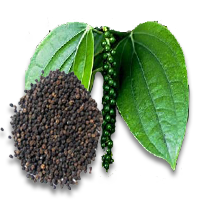 Black pepper is native to the Western Ghats of Kerala State, India, where it still occurs wild in the mountains. This area is thought to be the centre of origin for the crop because the diversity of cultivated forms are greatest here. It has spread from India to Southeast Asia through pepper vine cuttings brought by people migrating from India to Indonesia and other countries. Pepper has been one of the most ancient commodities of the spice trade. Together with ginger, it has the longest history of export from South Asia dating back at least 4000 years. Most ports and trading stations for black pepper were located in Southwest India where wild populations of the plants grew. 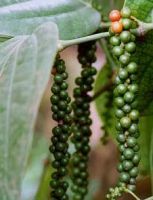 Apart from India, black pepper is widely cultivated throughout Indonesia, Malaysia, Thailand, Tropical Africa, Brazil, Sri Lanka, Vietnam and China. The popular names designated to the crop, such as " King of Spices " and " Black Gold " reveals the importance of the crop-attained world over. Being a native of Western Ghats, pepper forms an important ingredient of several indigenous medicines of India. The name pepper comes from the Sanskrit word “pippali” meaning berry. Black pepper, Piper nigrum L. belonging to the family Piperaceae, is a perennial, climbing vine indigenous to the Malabar Coast of India. It is a branching vine with a smooth, woody, articulate stem swollen at the joints. As a woody climber, it may reach heights of 10 m by means of its aerial roots. Its broad, shiny green, pointed, petiolate leaves are alternately arranged. The sessile, white, small flowers are borne in pendulous, dense, slender spikes of about 50 blossoms each. The berry-like fruits, or peppercorns are round, about 0.5 - 1.0 cm in diameter and contain a single seed. They become yellowish red at maturity and bear a single seed. The odour is penetrating and aromatic; the taste is hot, biting and very pungent. Black pepper is used universally in sauces, gravies, processed meats, poultry, snack foods etc. Both black and white pepper are used in cuisine worldwide, at all stages of the cooking process and as a table condiment. White pepper has a distinguishably different flavour but is utilized to a lesser extent. It is used in processed meats and in applications where dark specking is not desired. Black pepper is added to fruitcakes and gingerbread and is also used as a light seasoning on fresh fruit. Black pepper oleoresin is used for similar purposes.